I haven’t had much time lately to post anything I’ve made. D, however, has been a vegan chef supahstah! 🙂 Her food is quite excellent and very, very yumyum. Anyway, there are a whole bunch of us at work that have January birthdays, and last week there was a mini-celebration for us. I figured, though, that being vegan in this setting would be challenging, so I wanted to bring in something so that I could enjoy the celebration and introduce people to vegan goodies. I found a recipe for cinnamon rolls, but they had almost 500 calories each! As much as I love me some cinnamon rolls, I’m not, at this point, willing to lose focus on losing weight. 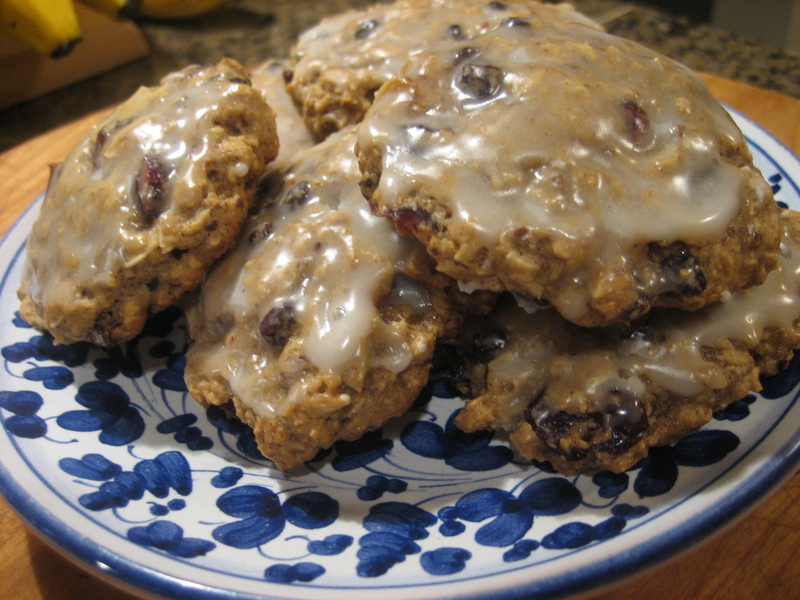 After searching a little more, I came across a recipe for iced oatmeal cookies in the February edition of Vegetarian Times. These cookies were fantastic and had only 99 calories per cookie. I used currants and cranberries instead of raisins. Mmmm. And, I heard compliments on them from the people at work as well as from D. 😀 The recipe, I’m assuming, will be available on their website when they update it for February. If not, scurry on out to your nearest bookstore and pick up a copy!